When [Jesus and his disciples] came down from the mountain, the disciples stood with Jesus on a large, level area, surrounded by many of his followers and by the crowds. There were people from all over Judea and from Jerusalem and from as far north as the seacoasts of Tyre and Sidon. 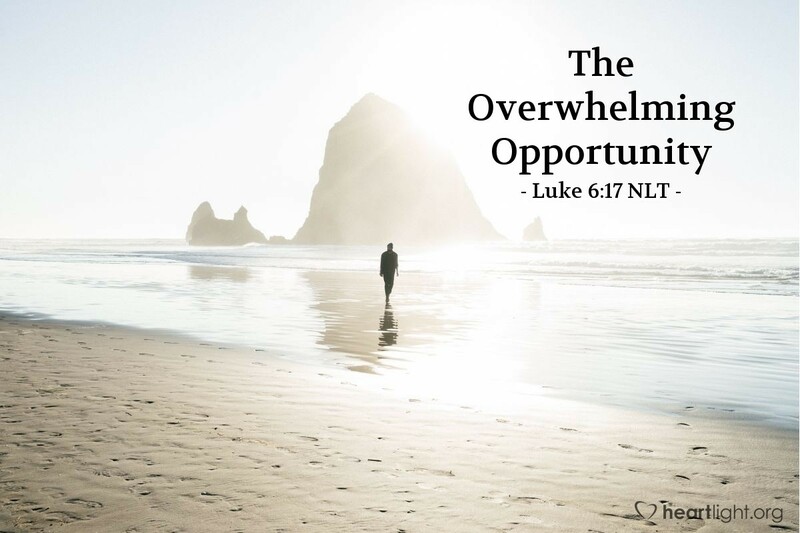 The twelve disciples Jesus chose to be his apostles didn't have to wait long to be overwhelmed with opportunity. After being called by the Master, they were immediately surrounded by the masses that were yearning to find the grace that God offered through Jesus. Who is sufficient for such a challenge? None of them! None of us! Yet the issue isn't our sufficiency, but the sufficiency of the one on whom we rely. Jesus equips and makes us ready for service in his Kingdom. He is the one who makes us perfect in our weakness to be a blessing to those searching for grace. Don't be discouraged by your insufficiencies, but draw near to the Lord and depend upon his grace to be sufficient for you. Father, I confess that I have sometimes limited your work in my life by trying to do that work by my own power. I truly believe, dear Lord, that you long to do greater things in me than I can imagine. However, I know that my limited strength often keeps me from being useful to you. My inability is not because you cannot be sufficient in my weakness, but because I do not look to you to make my weakness a perfect place for your strength to be displayed. Please forgive me and change my heart, so that I can be fully useful to you. In Jesus' name, I pray. Amen.